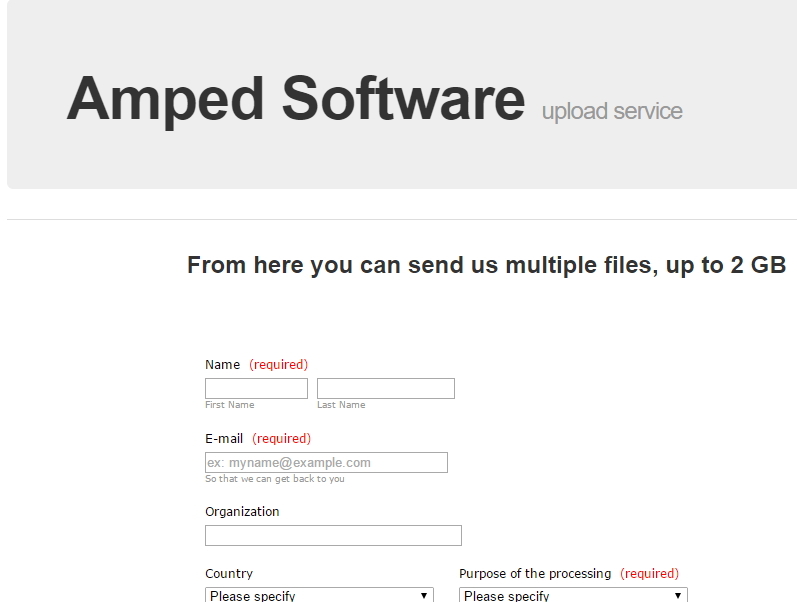 Simplicity, speed, and forensic integrity all come together in Amped’s latest software, providing law enforcement and digital forensic labs with a quick and easy stand-alone solution to the challenge of video conversion. 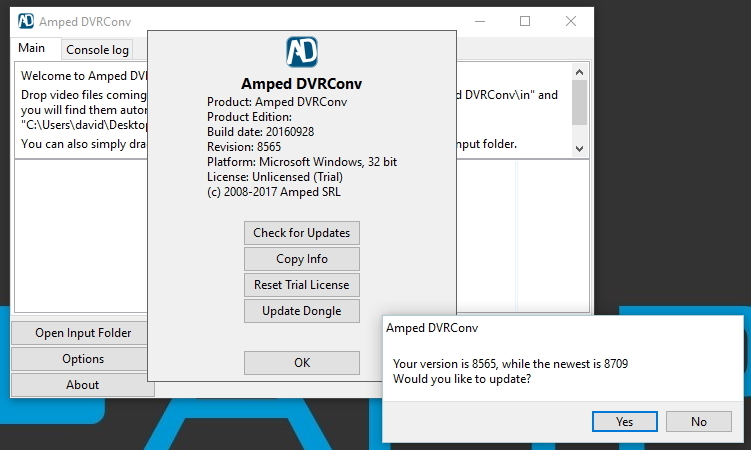 It’s been a few months since its release, so hopefully by now, you will have seen the blog posts and press releases regarding Amped DVRConv. It is a very easy program to use…it really is. You tell the application that you have a video file that you cannot play, the software analyzes the file and format, and then it gives you a video file that you can play in any standard playback software, along with the conversion log for full disclosure. How do you tell it? That’s easy as well. You either use drag and drop, copy and paste, or even have it ‘watch’ a specific folder and then convert immediately. DVRConv has a ‘clean’ install. What do I mean by this? Well, it doesn’t integrate itself within the Windows Operating System and doesn’t place codec packs, or other files, within system directories. It also doesn’t require any specific program framework to be installed separately and doesn’t require any other application for functionality. Once installed, the interface window will appear and a shortcut will be placed on the desktop. A DVRConv folder will also be created on the desktop – I’ll come back to that in a bit! The interface shows some Help text, followed by the main ‘active area’. Under this are the Action buttons. This is where you set up the conversion parameters. You will notice that the first four directories are all within a DVRConv folder. This is the folder created automatically during installation. You can change any of these settings by adjusting the folder locations. Under these folder dialogues, you will find a series of selection boxes. The Preset Options give you a quick method to select the required output format (container), and the codec. You will notice that the first two will attempt to copy the input streams first. Following that, we have some specific format and codec configurations and then a Custom option. The Custom option will automatically be selected if you change any of the following four selection boxes. 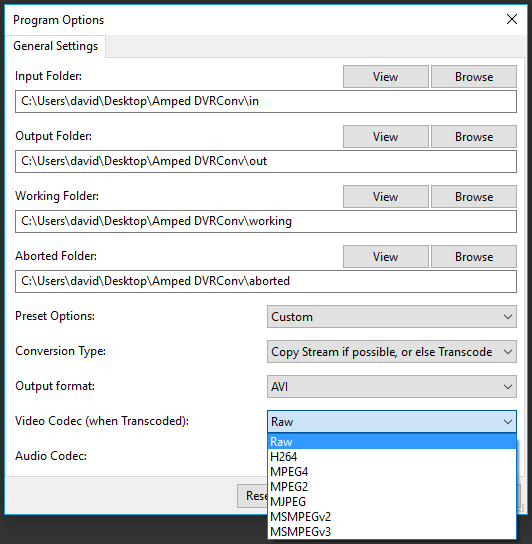 So, in the example above, as I have selected a RAW Codec (Uncompressed), if the format could not be converted with stream copy, then the files will be re-encoded in RAW Uncompressed. A format is the holding container. AVI, MP4, MKV etc., etc. A stream is the data relating to information such as video and audio. These streams, when digitized, will have to use a CODEC, (short for Code / Decode). If you think of the format like a box, and inside that box is streams, those streams will be in a specific language…this is the type of codec. Now that that’s understood (hopefully), you will see the benefits to stream re-formatting. This is where the streams are simply copied, with no transcoding. It’s simply a case of placing the stream into another format. From an AVI container, to an MP4 container for example. It’s not only quicker, but it also retains the original data structure. Let us now return to the main interface, and drag a single proprietary CCTV file into the main window. The original file, in the .dav container, has been analyzed and then converted. My settings were to Copy Stream from the input file when possible and then place into the AVI format. After conversion, it has checked the file and then reported the process as successful. 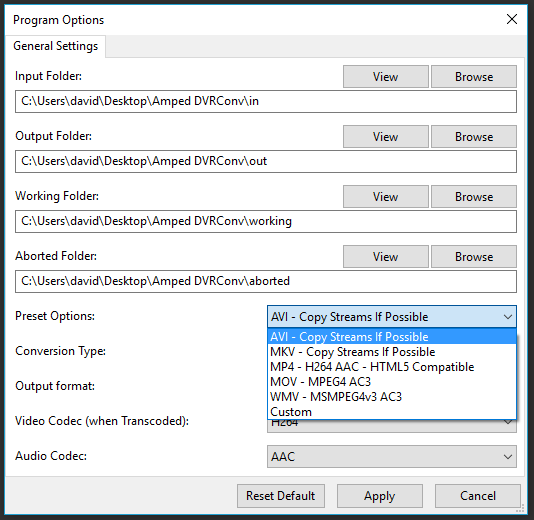 Originally, I would have to source the proprietary player for this file type and then perhaps install it on my computer. Now, within 7 seconds I have a file that is playable in most standard video players and I have not changed the data structure of the video–purely the container. If I selected Play Last Converted File, it would launch the player that was associated with the file format. The About button is important as it gives you quick access to check for updates. Due to constant research, development and codec integration, the updates will enable further successful conversions. That brings us onto a good point: what happens when something doesn’t convert? As you can see, it’s pretty clear. There are many reasons why a file may fail to convert. The conversion settings may not be compatible with the Input file. It may be worthwhile to check these and consider other options. It also may come down to the fact that this is a new or slightly different format. 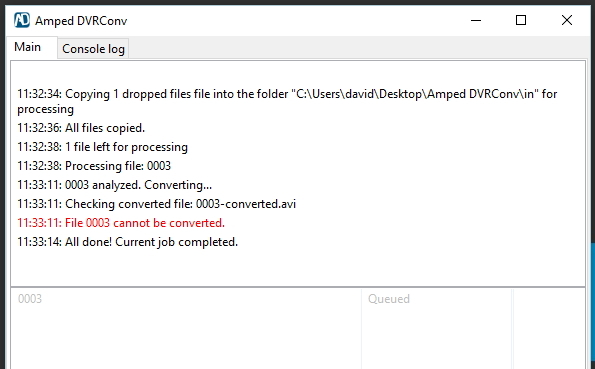 The log file detailing the failed conversion process and a copy of the file are still placed into the Output Folder, and it’s this log file that may be of assistance to us when you send the file to the Amped development team for conversion analysis. You can easily do this by clicking the Upload Video button to open the service in your web browser. Simply follow the details and we will get back to you ASAP on whether conversion is possible. Your assistance will not only help you in your current case but also help others in the future, as the parameters will be built into application updates. 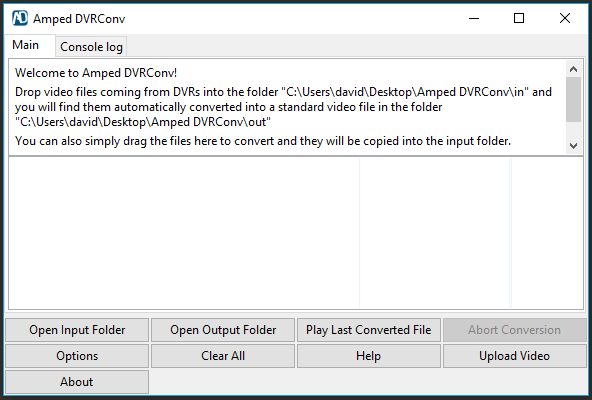 What I personally love about Amped DVRConv, is its ability to take in multiple files, in different formats, and then output them all into a single standard format with a simple drag and drop. It’s quick, easy and gets those files playing without having to install other software on a standard organisational desktop computer. 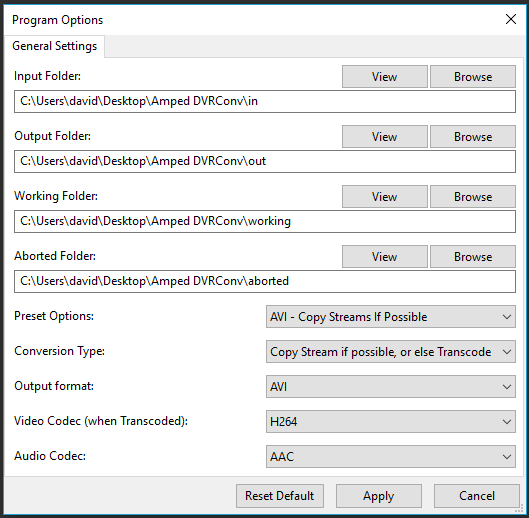 When you transcode or re-format a video stream, you may see some differences in things like timing or frame size. There are many reasons why this happens, and perhaps this will be the subject of another blog. The converted videos are there for you to quickly identify what information you have and therefore make better decisions more quickly. Further analysis and preparation of the original files may be necessary before they are submitted as evidence. If you have not received your quote to purchase Amped DVRConv, contact us now. This entry was posted in DVRConv, How to, Tutorials on January 16, 2017 by David Spreadborough.